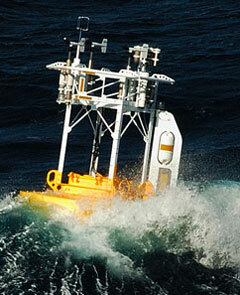 The CLIMODE buoy is located at about 38.5° North, 65° West. This is a project to study the dynamics of Eighteen Degree Water (EDW), the subtropical mode water of the North Atlantic. The program is a mix of in situ and satellite-based observations and modeling which will lead to improved parameterization of air-sea fluxes in a high heat-exchange region of the oceans, and improved ocean physics in climate models, capturing the eddy-mixed layer interactions in a region with both strong flows within the ocean and atmosphere and large wintertime exchange between the ocean and atmosphere. For more information on CLIMODE, visit the CLIMODE website. A moored surface buoy instrumented with a full complement of meteorological and subsurface oceanographic sensors was deployed on November 13, 2005 at about 38°N, 65°W, on a cruise aboard the RV Oceanus. CLIMODE was endorsed and supported by the Atlantic Implementation Panel under the US Science Steering Committee for US CLIVAR. UOP's particiation in CLIMODE is supported by the National Science Foundation (NSF) Division of Ocean Sciences (OCE). Partial support for CLIMODE infrastructure is provided by the Woods Hole Oceanographic Institution.